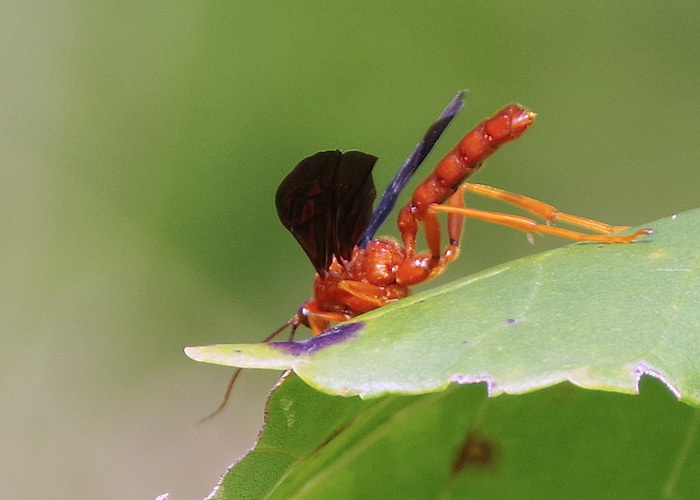 So, the orange wasp is (probably) Trogus pennator (no common name). Here’s a nice picture of one. 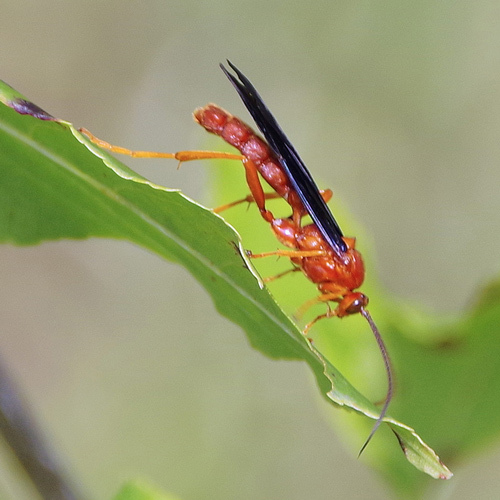 Trogus comes from a Greek word meaning “to gnaw” and pennator from the Latin for “feather” or “wing.” And yes, there is a look-alike, an unrelated spider wasp named Tachypompilus ferrugineus, but Tachypompilus has a smooth-ish abdomen, and Trogus’s abdomen has a “beaded” look. 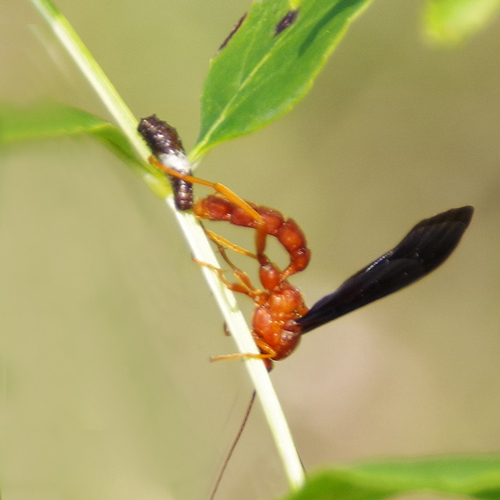 It has been suggested that Trogus pennator mimics the spider wasp because spider wasps can sting (painfully), while the Kaufman Field Guide to Insects of North America, says of Trogus’s subfamily Ichneumoninae that “Females have venom glands and some can sting weakly.” There are a dozen species in the genus, half of them in the New World. Credit where credit’s due – a good deal of the work that has been done on Trogus pennator has been carried out by researcher Karen Sime of Cornell University (Go, Big Red! 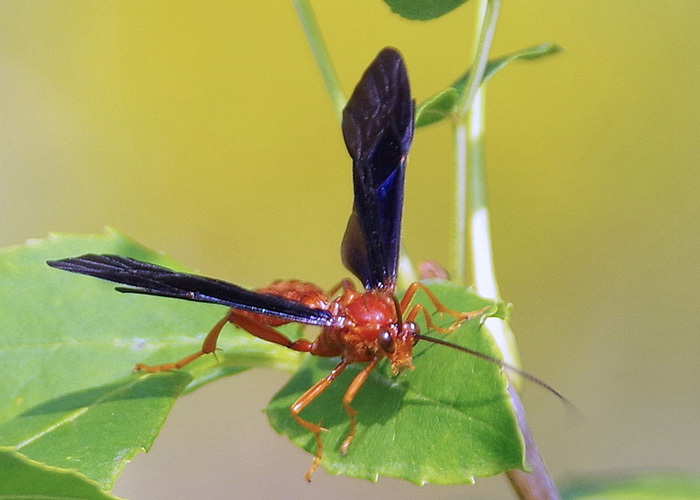 ), who theorizes that the genus originated in the Palearctic region (the northern half of the Old World) and arrived in the New World via Alaska on the heels of the spectacular Old World Swallowtail butterfly. So Ms. Wasp’s search was for swallowtail caterpillars, and a lot of research centers on exactly how she locates them. 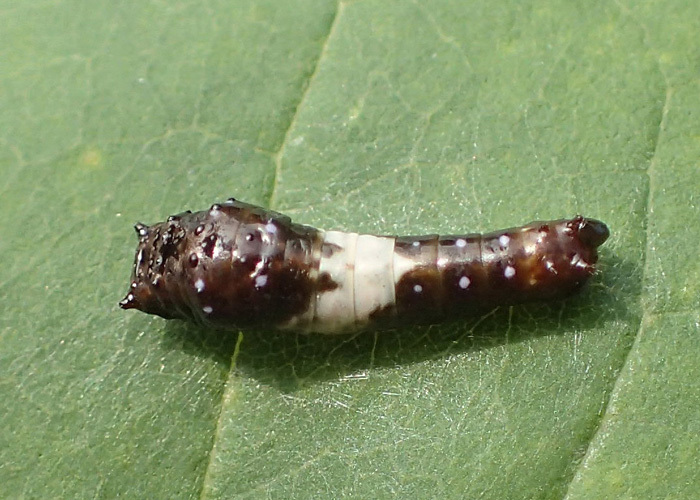 It’s possible that the wasp can identify the host plants visually, and she may be able pick up on the chemical signature of undamaged leaves, but in one study, Trogus pennator wasps targeting Zebra swallowtail larvae were found to recognize the odor that a host leaf emits when it’s damaged by grazing caterpillars. 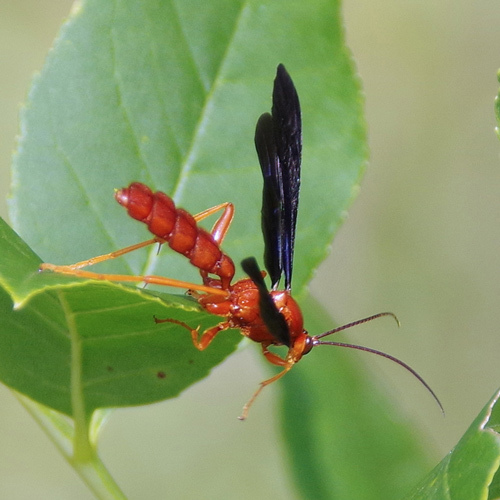 Once they’ve found caterpillars on them, “naive wasps” quickly learn their host plants. After that, they don’t waste time on non-host plants, and they concentrate on host plants with damaged leaves. But – think about it – does a wasp like Trogus pennator, which has more catholic tastes, learn to ID all of the host plants of Tiger Swallowtails (Butterflies of the North Woods lists about a dozen of them) plus the food plants of Black Swallowtails (here’s one that emerged from a Black Swallowtail chrysalis), plus Zebra Swallowtails, plus…. ?